Make sure that EasyTune will NOT auto start with windows. There have been way to many ET6 issues in the past, I want to choose when to run ET6, I don't want it running in the background and possibly causing problems, such as excessively high DPC spikes. But those 0.3 Gflops are not free since idle power usage of my system jumps from 95 W to 144 W without power saving options. 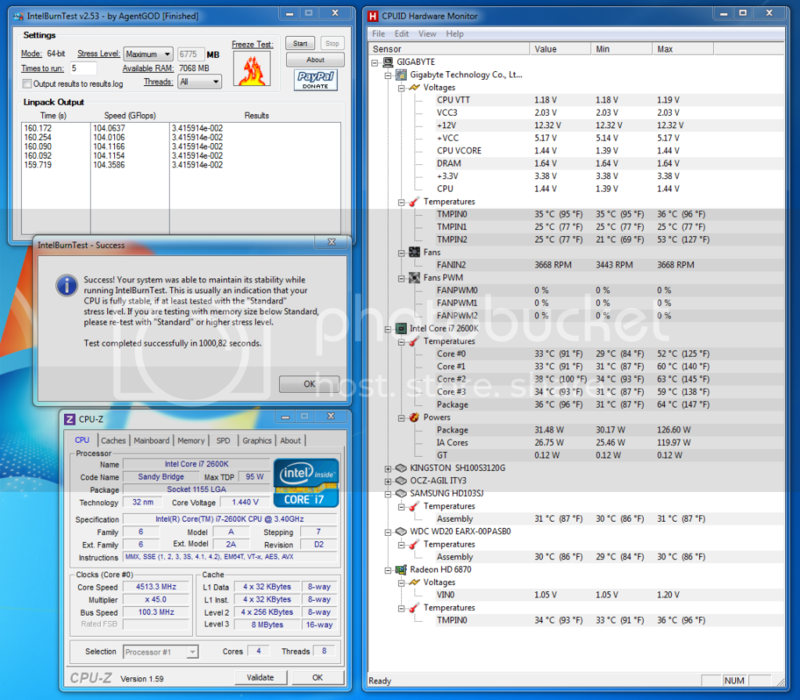 I am running graphics off the CPU in performance mode (still waiting for my MSI GTX 570 to arrive). If I remember correctly you should be getting something like 80 - 90 Gflops at stock settings. Bios Flashed to F5 (F6 beta not flashed as it is beta, will wait for final release) Edit: I Used QFLASH!! Sata drivers were pre installed. All other Motherboard drivers were manually installed. Dissabled Indexing via right click on drive in explore and un ticked box. Changed Intel Graphics setting via VGA driver application. 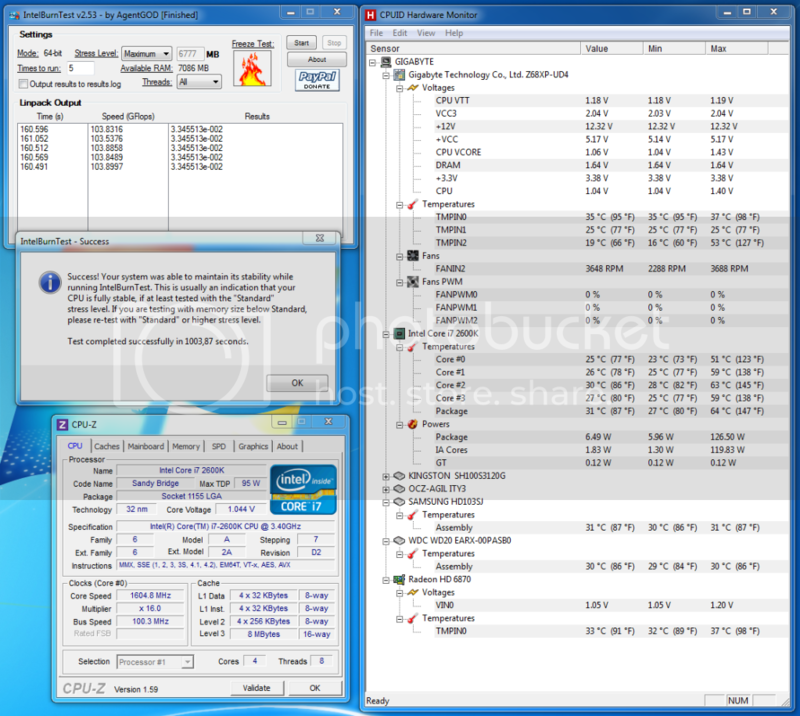 Intel Burn test passed (5 passes 4 threads max memory) with seemingly lower than avg Gflops according to user "MM67". Note no GPU card installed and running off CPU graphics for now. Prime 95 Blend test run for 7+ Hrs with no errors. Will run small and large FFt's later. Waiting on Prof Jim's SSD Os install guide to minimize SSD writes. Researching how to effectively relocate Users folder to HDD data drive. ( a lot of opinions on this!) thinking about starting new thread in regards to this,..but will elaborate a little now. Although I can easily create a new default save location for each libaray I want to have the entire Users folder relocated (I think ) But the issue with this is I am concerned with is some programmes hard code the default save path. Meaning These files will be stored in the original location (if it still exists) causing errors and the in ability to find them. I have heard you can place a junction between these to avoid the above problems but unfortunately know nothing about this. Run WEI immediately after win7 install to automatically turn off file Indexing and auto defagmenting of the SSD boot disk. Move selected folders from the ssd boot drive to the first hard drive's "Temporary" partition. Keep in mind that moving some folders to the hard disk will have a modest impact on overall system performance. Moving some folders will reduce the write/erase cycles on the ssd. This is most important with with smaller ssd's with less than about 90GB of formatted size. Junction Link: Junction Link Magic for moving selected folders to another location. Post #58 in http://forums.tweaktown.com/gigabyte...tml#post384044 shows a performance benchmark using the DataRam Ram Disk (freeware up to 4GB ram disk size). --> Control Panel --> System --> Advanced System Settings --> Advanced tab --> Performance --> Settings --> Advanced --> Virtual Memory --> click locations (e.g. D:\), click custom size and enter Initial and maximum sizes (MB), in my case both fields are set to 1024MB. Post #54: http://forums.tweaktown.com/gigabyte...tml#post384034 shows the very high amount of disk writes to the TempPoop folder while running an AVAST scan of my ssd!! Click on Computer --> Favorites --> right click on Downloads --> click on Properties --> Shortcut tab --> Target:X:\Downloads where X: is the hard disk partion for the Downloads folder. With a 640GB hard drive, the size of my Indexer folder is 1.66GB. All large game demo programs are installed on my hard drive E:\ partition. I manually save all documents, images, etc. to F:\My Documents_F. All of my media files (music, videos, photos from my digital camera, etc) are saved to folders on my G:\ hard disk partition. The hard drive H:\ partition is used for all archived files, including win 7's weekly backups and occasional images of my ssd. System Properties --> Advanced --> Startup and Recovery --> System Failure --> Automatically restart is unchecked so that I can view the full BSOD information. Check out the ssd tech support forums for your ssd brand. Guide THE BASIC GUIDE & FAQ - ABC for OCZ SSD - Index has a lot of useful information for many ssd brands. There are four pages in this thread. After one year of use, my 56GB (formatted size) ssd o/s boot disk is about 50% full. ATTO benchmarks are virtually identical to the original benchmarks and ssd life from SMART is still at 100%. This will be edited later and added to my ssd/win7 thread. Last edited by profJim; 01-08-2012 at 07:38 PM. Naw, I'm just a half-fast poster. BTW, the m/s SysInternals site has some excellent tools for downloading. Last edited by profJim; 01-08-2012 at 07:43 PM. Thanks so much that will be a massive help. Question,.What do you think of this and can I connect my HDD once drivers are installed from audit mode. When the installation stops, waiting for you to give the computer a username and a computer name, DON'T! Press Ctrl+Shift+F3, and the computer will restart in . . . (wait for it!) "Audit Mode"!. Basically, Windows will create a throwaway Administrator account and sign you in, as this throwaway Administrator. Nothing you do, with regard to this temporary user will survive finalizing the installation, but the computer operates normally, and you can install drivers and software. Whenever the computer starts in Audit mode (you are allowed to restart), a GUI version of Sysprep.exe will pop up, offering to restart the computer in OOBE (out of box experience). OOBE is where you were a moment before -- that is, where you create a username and computer name and the installation is finalized. Don't choose to restart in OOBE until you are ready to finalize the installation. I think I want to set junctions and setup windows inside this audit mode! I'm not familiar with audit mode, so I can't make a recommendation. Have you created an image of your ssd yet? I think that you will have to reinstall most or all of your programs that are already on your hard drive. Don't worry about writes to the windows registry. To minimize ssd writes, move your TEMP, TMP, and DOWNLOADS folders to your hard drive before installing new programs or updating to SP1. I think that moving the USERS folder off of the ssd will hurt performance somewhat. With your sata3 ssd and motherboard, the performance hit will probably be greater. I think that my USERS folder uses about 2GB of space on my SSD. Last edited by profJim; 01-08-2012 at 08:03 PM.